“Rejoice in the Lord Always” - Philippians 4:4 I truly can rejoice in the Lord for these 60 years of abundant blessings. I was born in Mt. Pleasant. My parents were Floyd and Velma (McKnight). When I was 7 and my brother Don was 2, my mother had a heart attack and died. It was a very difficult time for me and I could hardly sing “Jesus loves Me” during my Sunday School classes. Everything changed when in 1949 my dad married Marie Esch and our family was baptized into the Catholic faith. My first encounter with Sisters happened while I was sitting on our porch at home watching a parade of “funny looking ladies” go past our house. One day I asked them who they were and they replied that they were Catholic Sisters studying to become teachers. I attended elementary grades (K-6) at the Central College lab school. I attended the Catholic school from 7th grade until graduation and had Dominican Sisters as teachers. I entered the community following my graduation in the fall of 1957. I desired to share my faith and teach, which I did – mainly in the primary grades. I enjoy doing activities with our Sisters at Aquinata Hall. Each day I thank God for being with me on my faith journey, for being my strength in hard times, and for a loving community. With Bachelors degrees in History and English from Aquinas College, Sister Mary Jo Beckett was well-trained for her 23-year ministry teaching primary grades began in 1961, calling her to St. Michael’s in Maple Grove; St. Mary Magdalen, Melvindale; St Joseph the Worker, Beal City; and Our Lady, Chesaning, and Sacred Heart, Mt. Pleasant. In 1975, she earned her MA in Elementary Education from Central Michigan University. In 1988, Sister Mary Jo focused her ministry on religious education. 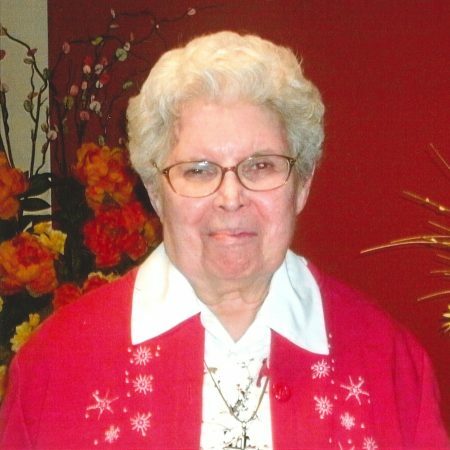 She served as DRE and in pastoral ministry at St. Joseph, Saginaw, and Guardian Angels, Manistee. Central Province Dominican Friar Novices visited the Dominican Sisters~Grand Rapids. Sr. Mary Jo Beckett, OP, sharing Liturgy with one of the Friar Candidates. Sr Mary Jo Beckett plays an active role engaging Sisters during Energize Your Brain programs at Aquinata Hall. Sisters Mary Jo Beckett, Regina Goeldel, and Maria Tardani: dedicated baseball fans rooting for both teams at Let’s Go to Bat for Kids to raise funds for Catholic Charities West Michigan.